Motherwell gaffer Mark McGhee thinks his side can still qualify for the last 16 of the Betfred League Cup despite losing to Rangers. 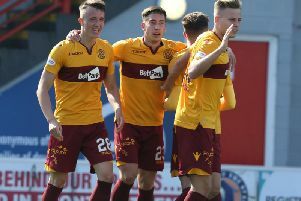 McGhee’s side are bottom of Group F but would guarantee second place – and probable qualification as one of the four best runners-up in the eight groups – if they beat Annan Athletic, East Stirling and Stranraer in their next three group fixtures. “I would like to think we can still qualify,” McGhee said. “The performance against Rangers showed you we are at it. “It wasn’t an abject performance. “We made eight or nine chances that should have resulted in two or three goals. “We should at least have taken the game to penalties. Meanwhile, McGhee said that work was still ongoing to find a new Motherwell assistant manager, following previous incumbent Steve Robinson’s recent departure for Oldham Athletic. “There are lots of people interested in the job,” McGhee said. “I’m flattered. “There is no panic in having to appoint someone at the moment.